Another round of Super Rugby has come and gone with the Sharks victory over the Lions one of the standout results of the round while the Blues claimed their fourth consecutive victory. Elsewhere the Jaguares stunned the Bulls late in Loftus. The Beast was at his best in his milestone 157th Super Rugby appearance. The screams of "BEEEEAAASSTT" lasted much longer than in recent times when he carried the ball. He was strong in the scrum against the promising Carlu Sadie while Coenie Oosthuizen struggled on the other side of the scrum. If anyway one thought that Steven Kitshoff would just walk into the Springbok #1 jersey, think again, the Beast is flying high and is in superb form in a big year of test rugby. A close call between Brandon Paenga-Amosa and Funnell but the Crusaders man gets the nod after he was given a rare start for the Canterbury side. He was busy around the park and accurate at the lineout. Marx was a menace at the breakdown as per usual but failed to lead his side to anything more than a trouncing in the Lions Den. Powerful in the set pieces and busy around the park, Lomax continues to deliver on his early promise and will surely add to his single test cap. The All Black edges Jermaine Ainsley and the Reds' busy South African tighthead Ruan Smith. Numerous players can really lay claim to the jersey this week. Patrick Tuipolotu was sensational in leading his side to their fourth consecutive victory while Sam Whitelock was incredible off the bench for the Crusaders. Finally, Matthew Philip was excellent for the Rebels as he continues to lay claim for a Wallabies recall. In the end, it goes to the Waratahs' Tom Staniforth who racked up an impressive 20 tackles, without missing, made 11 carries off the bench following Ned Hanigan's injury. Barrett is one of form second rowers in the competition with his work rate and aggression playing an important role in the Crusaders win over the Brumbies. Excellent at the lineouts, physical at the breakdown and rampant with his carries. Barrett is pressing for a starting role with the All Blacks and could possibly force Hansen in selecting him on the side of the scrum. Frizell was the standout for the Highlanders making 12 carries and 8 tackles. He also continued his impressive try-scoring record and racked up 30 running metres. His aggression and work around the park will certainly impress Steve Hansen. The Sharks' Luke Stringer impressed in far different role than that of Frizell as he linked up nicely with some nice handling skills and good ball carries. Ardie Savea was in sensational form for the Canes and was involved in nearly every phase of important play. On attack, Savea managed to gain 100 metres in the match, beat three defenders and score two important tries. Savea has been incredible since Sam Cane's unfortunate injury and if he continues in this vein it will be difficult for Hansen to pick who will be his made to start in the 7 jersey. We have moved Matera into the #8 jersey as we feel both he and Frizell thoroughly deserve a place in our team of the week. Matera scored a crucial first-half try racked a stellar 57 running metres from 8 carries and beat 4 defenders. He also made a hefty 13 tackles. The Sharks' Daniel du Preez can certainly feel aggrieved with Matera's shift to no.8 after his starring role in the Sharks romp of the Lions. Genia has been even more outstanding for the Rebels since his longtime mate Quade Cooper and his performance against the Sunwolves was no different. He kept the Rebels attack ticking over and tested the defence brilliant he made 85 running metres beat two defenders making three clean breaks and came up with a try assist and a try of his own. Bryn Hall's performance against the Brumbies came in a close second. The Jaguares' Domingo Miotti's blockbuster debut off the bench deserves a mention at least. However, Mo'unga heroism against the Brumbies can't be beaten. Mo'unga lead the second half romp of the Brumbies making over 90 running metres, beating 6 defenders and made a clean break. He played a role in just about everything that seemed to go right for the Crusaders. Mapimpi scored a superb brace for the Sharks as they wallop the Lions at Ellis Park. 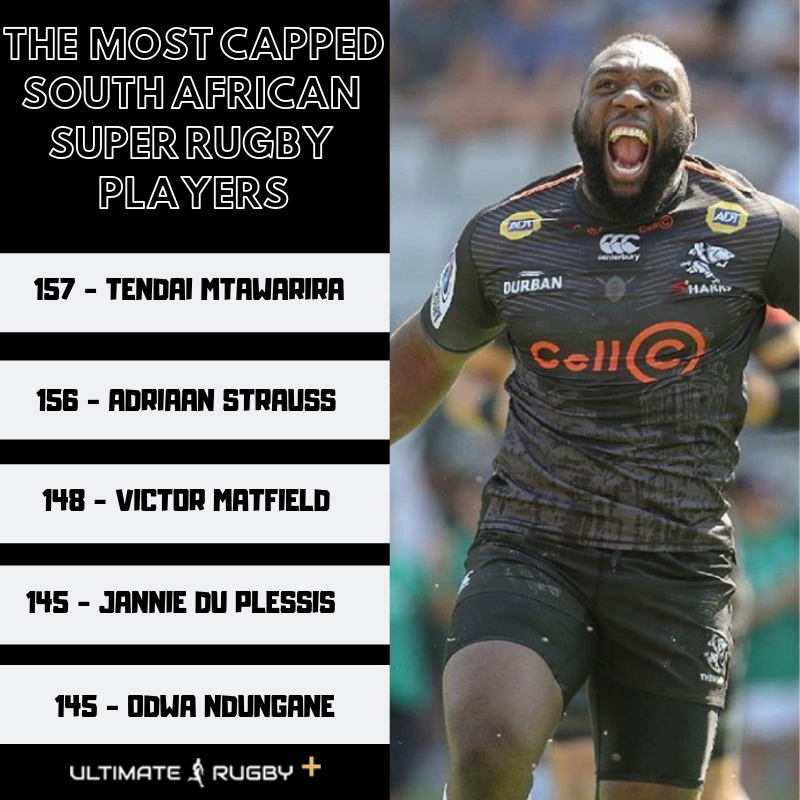 He was one of the Sharks most lethal weapons racking up a match-high of 120 running metres beating three defenders and making 5 clean breaks in a performance that has certainly catapulted him back into the Springbok conversation. Ryan Crotty was in fine form for the Crusaders as too was Samu Kerevi but the marvellous Ma'a Nonu was cut above the pack. If Nonu wasn't already part of the All Black's world cup conversation he is certainly one now. Steve Hansen certainly has his hand full when narrowing his options but going with two-time World Champion that is in fine form is certainly not a bad call. Nonu was back to his old tricks as he rampaged through the Waratahs' defence and still managed to show off some of his playmaking ability grabbing two assists. Another stunning performance from the Sharks centre. Am running some truly sensational lines that lit up Ellis Park and his work in the rucks saved the Sharks a number of times with the Lions looking threatening on the counter attack. He won an unprecedented 4 turnovers. His attack was just as brilliant, he scored a try, beat 5 defenders made 2 clean breaks and gained 83 running metres. It's hard not to include a hattrick hero but Hodge did more than just slam the pigskin down over the line. He made over 100 running metres beat five defenders and came up with a try assist. He shifts onto the wing at the expense of Sevu Reece who was exceptional against the Brumbies. Finally given his opportunity in the starting line up, Bosch took his opportunity with both hands and sent a strongly worded message to the Sharks coaching staff. Bosch sparked just about every attack that the Sharks benefitted with his sheering pace and shift footwork. He made over 100 running metres beat a stellar 9 defenders and grabbed three try assists.